I definitely consider this art. Frame any IMAGE.............! Place that framed image into any art gallery; That object is now referred to as FINE ART! Even if it is a drawing of a paint brush - or bycycle! To the OP - "Bravo" !! I see it as an illustration of a bike. copy, xerox or photo silkscreen these type of images to superimpose to their own paintings, collages and ceramics. I'll start by saying I've been drawing all my life, although I've never been especially knowledgeable in the subject of art. Most of my drawings are very mechanical in nature, almost like technical drawings but also a little different. I always get ideas for products, or designs, or inventions, and then I draw them out to kind of develop my idea. So really my drawings have always just been a tool I use to help me visualize ideas I have, usually for mechanical things like cars or bicycles. I've never really thought of them as art, necessarily, although I also don't think of them as blueprints either (although I've drawn blueprints as well; I used to be a drafter). So what do you think? Would you call this art? Or is this closer to a technical drawing? I love the colors. Strong but soft, warm and blend well together. The drawing, of course, is that of an expert. And those colors - fine art. Yes. Keep it up. This illustration of a bicycle is not Art, to me. The illustration is a perfunctory mechanical description a totally mundane object; as such, it leaves me "cold." It has no emotional content for me, nor any intellectual content, as there is nothing about this bicycle that challenges my thinking about bicycles, or engineering, or life, etc. The color scheme is perfunctory and although well executed, does not particularly stimulate me in any pure plastic sense of the medium. The texturality of a Monet or Van Gogh painting interests me as a painter; this illustration does not. Andy Warhol made celebrities look interesting by using vibrant colors; this illustration takes no risk and has no plastic expression. I see this drawing as "a competent drawing." Not Art. Art should reach for more than what can be perfunctorily described. There are many ways that one could go to try to make this into Art, but as it stands, it is merely a beginning, a technical accomplishment only. There are many ways that one could go to try to make this into Art, but as it stands, it is merely a beginning, a technical accomplishment only. Curious would you consider these art? I suppose it's Art, as Art has often embraced technical tours de force. But to be honest, it's the complete opposite of work that inspires me. After one has marvelled at the technical skill of reproducing visual reality, what is left? There is no message, no meaning, other than the artist's extreme technical skill. We can accomplish a similar end result with a camera; we ooh and aah that a human being can behave like a camera. Perhaps it meant more before we had cameras. The 2nd painting has much more of an artist's interpretation of reality in it. It presents an intellectual puzzle, how can coherent images be formed from seemingly strange shapes? Last edited by bvanevery; 12-03-2013 at 12:18 AM.. It's a matter of preference and personal taste. 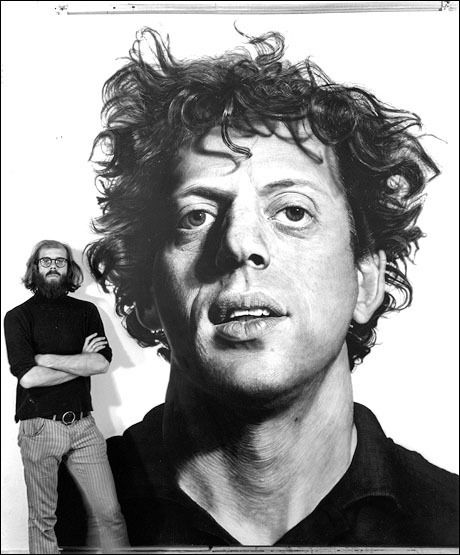 Chuck Close's early work do inspire me for many reasons. with the paintings is to walk back several feet and see an image of a person. btw.....here's another link he did before his illness. im more into involuntary abstract. lol.